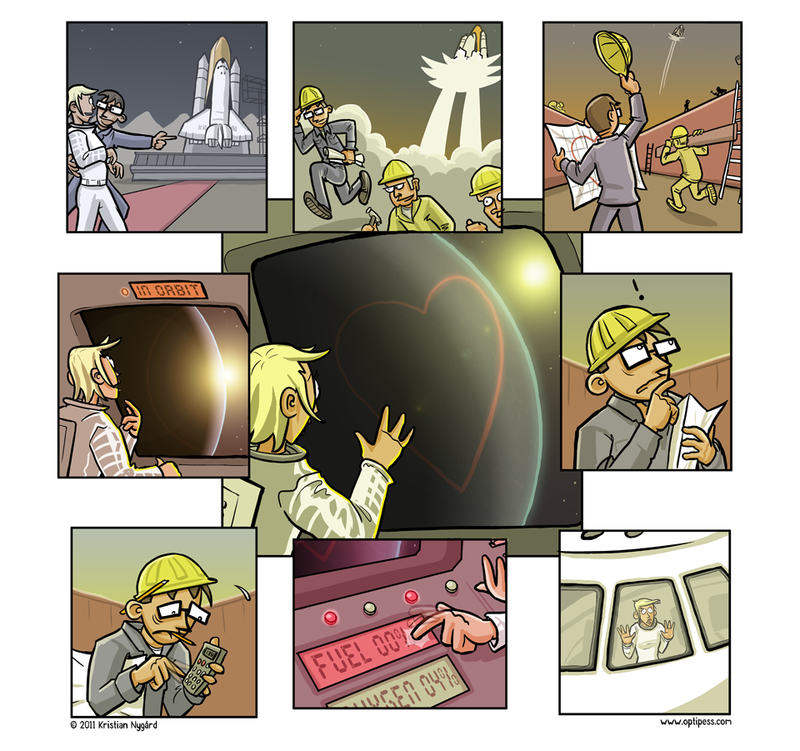 So he sets up a giant heart across the earth, and then realizes he forgot to fuel up the rocket? Yup, this one was hard to get and I am not sure if I am getting it right. He spent a lotta time planning the heart thing and then he realized he forgot to make proper calculations for fuel and oxygen? May be the only one that’s a bit tooo dark for me…. *whispers* hurmmm, I don’t get it. She’s gonna be fine, though! There’s no Somebody Dies tag! I think the heart is supposed to be a lense flare. Don’t ask me how he made it heart-shaped or why she can see it even though this is not a photo. Erm, Geust’s got the right idea. The ultimate futility of such a grandiose effort was pretty amusing to me. I assume she returns safely: there’s no “someone dies” tag. So why does he need a calculator to realize that he forgot to fuel up the rocket? Hm, I didn’t intend for this one to be this confusing, but ohwell. Also, apologies to Dexter – your comment got caught by the spam filter, but is now approved! edit: And yes, you got it exactly right.